This exercise is part of the Yellow Badge. You can get a certificate of completion if you complete all the exercises in this badge. 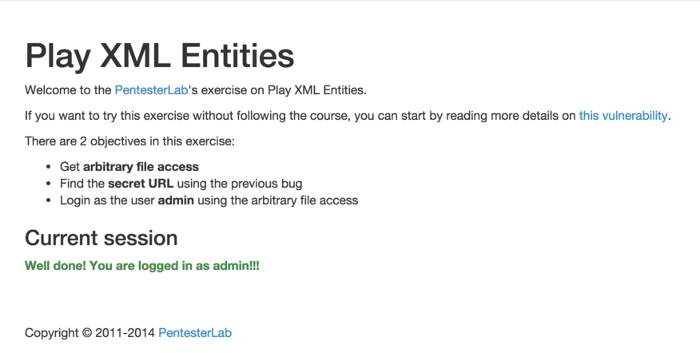 This course details the exploitation of a XML entity bug in the Play framework. This issue can be used to retrieve arbitrary files and list the content of arbitrary directories. The interresting thing about this bug is that it's completely transparent and can stay (and stayed) unnoticed for a long time. To find this bug in a black-box test, you need to know what you are looking for. If you want to go ahead without following the course, you can find the advisory here. The Play Framework is a web framework that allows developers to quickly build web applications in Java or Scala. The way the code is organised and the URL are mapped are very similar to Ruby-on-Rails. Like Ruby-on-Rails, Play (auto-magically) manages multiple content-types when it receives HTTP requests. Here the application is really simple and has nothing to do with XML, it's just a simple login page. However, since the Play framework automatically parses XML requests, we are able to exploit this bug to read arbitrary files. From a web server (HTTP, HTTPs). This can obviously be used by an attacker to retrieve sensitive information on the application (path, passwords, source code,...). The bug impacting Play was a XML entities bug, however this attack is completely blind and no information will be displayed in the response. That's why we will need another way to get information out. One to send the initial request (step 1). One to retrieve the information sent by the server (step 5). First, we need to send the right HTTP request. The easiest way to do that is to build a tiny script that will connect to the server and send the request. We don't really care about the response but we can still retrieve it. You can perform the same thing with a proxy (preferably with a repeater mode) or manually with netcat. The only thing with netcat is that you will need to manually set the size of the Content-Length header. Remove all the uneeded information to make debugging easier. To add the XML message in the body of the request. To change the Content-Type of the request. Where http://192.168.159.1:3000/test.dtd is the location of the DTD. Now that we have a proper HTTP request containing XML, we can send it to the server. If all goes well, the server should respond with a HTTP 400 error as it's unabled to retrieve the DTD. 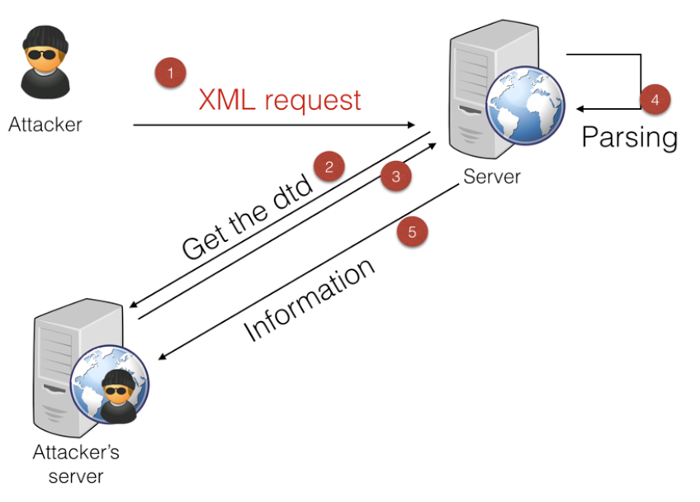 To serve the DTD or any file, you will need a web server. This can be done with any server, however you will need to be able to see if the server tries to retrieve the DTD. In a real scenario, the server may not be able to access your server, so you will need to be able to detect that something is preventing that. alias web="ruby -run -ehttpd . -p3000"
Run a web sever and use tail -f on the log to see every request received. Where [/etc/passwd] is the content of /etc/passwd. If you look back at the initial request that we sent, the body contains a reference to e1: <foo>&e1;</foo>. Once the server finished processing the DTD, it will resolve the reference to e1 and send the content of /etc/passwd to your server. netcat -l -p 3001 but you will need to restart the process every time you access the TCP port. socat TCP-LISTEN:3001,reuseaddr,fork - that will not shutdown after the first request but can block after few requests. In the wild, you can't be sure that the server will be allowed to connect back to you. To detect this bug (and if the server resolves external names), you can use DNS. To do so, you just need to setup a DNS server and monitor its logs. Then you can send the initial request with a XML entity pointing to your domain: http://rand0m123.blah.ptl.io/. If the server is vulnerable to XML entity attacks (and can resolve external DNS name), you will see a DNS query from the vulnerable server. Now that everything is working, we will need to find the secret URL. Play framework uses a route file to configure what URL are available and what method should be call. We need to find this file to get access to the secret URL. A common way to find where the application is located is to access the environment. This can be done by trying to read /proc/self/environ. However, this will not work as the parser does not support reading from /proc (probably because it's using DataInputStream). The home directory of this user is /opt/play-2.1.3/xxe/, there is a good chance that it's where the application is located. Using this, you should be able to find conf/routes. Once you managed to retrieve this routes file, you should be able to access the secret URL. Another important file for a Play application is the application.conf, this file contains the secret used to sign the session. This file is also available in the conf directory of the application. Once you have that file, you can easily sign your own session using the secret. 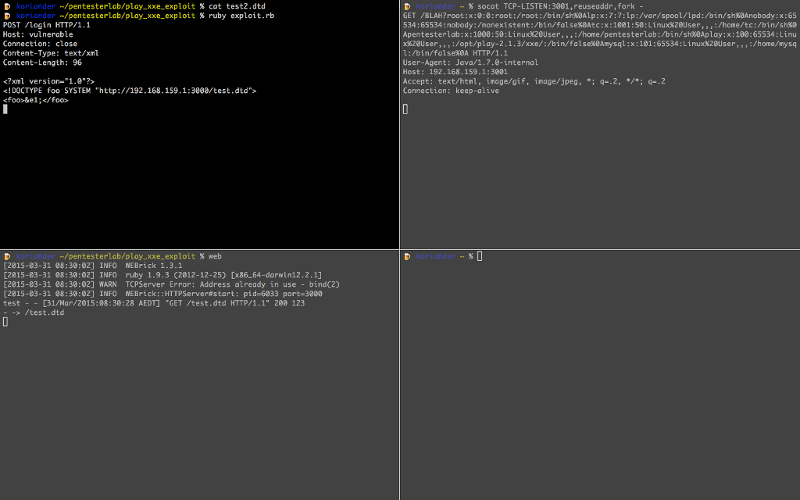 First, you need to retrieve the conf/application.conf file using what you saw above. The second step is to forge and sign your session using this secret. To do that we need a better understanding of what is in the session. We can leak the source code of the application to get a better understanding of the logic in place. Based on the conf/routes file, we know that the method controllers.Application.login is called when we submit the login form. By convention, this code is available in app/controllers/Application.java (or .scala if it's a Play application using Scala). We will need to forge a Play session that contains the variable user with the value admin. If you looked at our other exercise on Play: Play Session Injection, you may be surprised that the internals of Play's sessions have changed since. KEY = "[KEY FOUND IN conf/application.conf]"
The final step is to know the name of the session's cookie. Since it has not been changed in conf/application.conf, the default name is used: PLAY_SESSION. 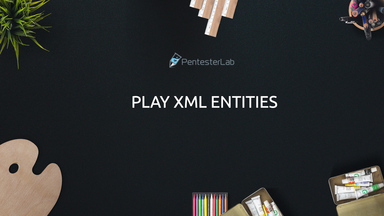 This exercise explained you how to exploit a XML entity bug in the Play framework. This bug is pretty interesting since it impacts the framework itself as opposed to the way the developers used it. I hope you enjoyed learning with PentesterLab.